I must introduce what a keylogger is before I start this review. Keylogger is just a tool which can be used for recording, logging, or backing up all the words typed on the keyboard on a Mac or PC. When you read this, you may ask me why we should record all the keystrokes. If you stored important or sensitive information in your Mac, how can you tell if someone else has accessed it when you are away? Or if you spend much time typing in the middle of a long post but the browser or your Mac crashes suddenly, how can you retrieve all your efforts? However if you have installed a keylogger on your Mac, the problems mentioned above will be easily solved, for a keylogger can log all user keystrokes. With this function, it can also be used for recording email, chatting contents, and document typed and more. I’m using Anykeylogger for Mac 1.92 now. It’s really easy to use and occupies very little bit of CPU and memory. It is a good solution to record all keystrokes as well as other computer activities in hidden mode. 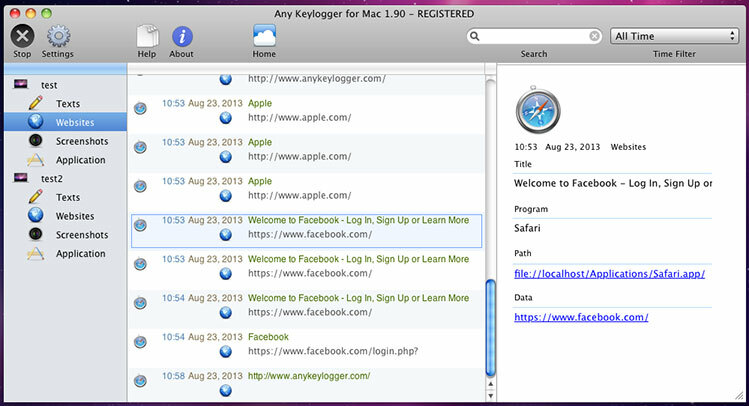 Anykeylogger group has launched three types of keyloggers, and Anykeylogger for Mac, a product of Anykeylogger group, is designed for Mac users, which can monitor visited websites, screenshots, applications running in the Mac, and of course the texts typed on the keyboard. Apart from recording what I typed on the keyboard, it’s also useful for monitoring what websites visited or applications run by others in Mac. It secretly runs in background and my antivirus program do to monitor overall pc activities including visited websites, executed online applications, and so on. I’m using it for backing up and monitoring some activities now, but I think its functionalities are not that comprehensive, it will be more powerful and user friendly if it can monitor IM chat. Hope the developer improves it in this point. Its user friendly interface is another attractive factor for me, for I like those apps that have simple and straightforward interface and rich functions. It can work stable in Mac and send the reports of monitoring logs to my setting email address. To sum it all up, Anykeylogger for Mac 1.96 is pretty handy. Unfortunately, it lacks specific classification about monitoring logs; it will be perfect when it’s added functions about parental control. Related to "Anykeylogger for Mac Review"